The White Star greyhound Germanic. A drawing depicting the Germanic in port. The swift Germanic at sea. This photo shows her after her two funnels have been heightened. 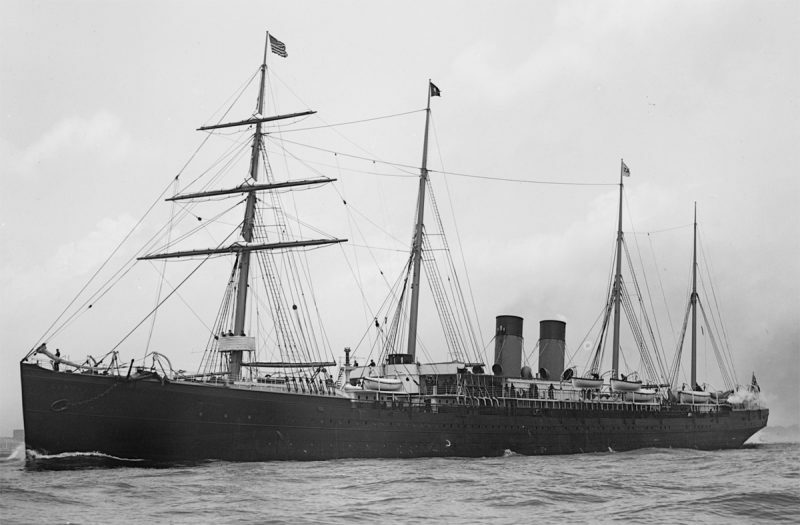 Germanic in New York, in February of 1899. 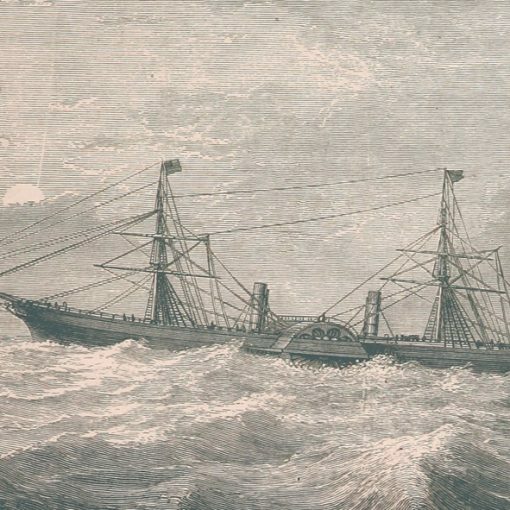 After a rough winter crossing, with ice covering parts of her masts and rigging, the listing ship would soon take on water and sink at her pier. The former Germanic under Turkish ownership, sporting her new name Gulcemal. 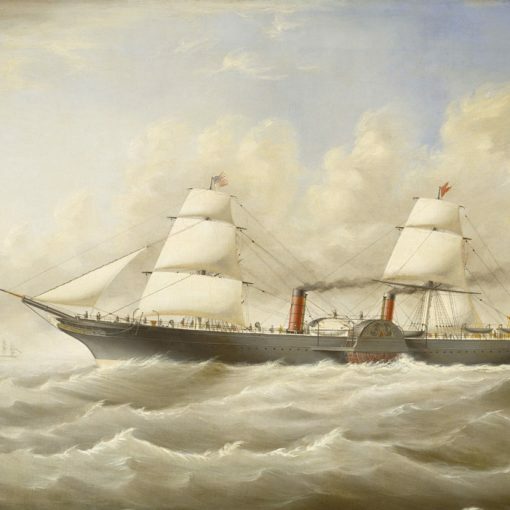 In the beginning of the 1870s, the White Star Line felt it was time to update their fleet. At this time, speed was still one of the most important things for the company. It was not until about twenty years later that White Star decided against extremely fast vessels. 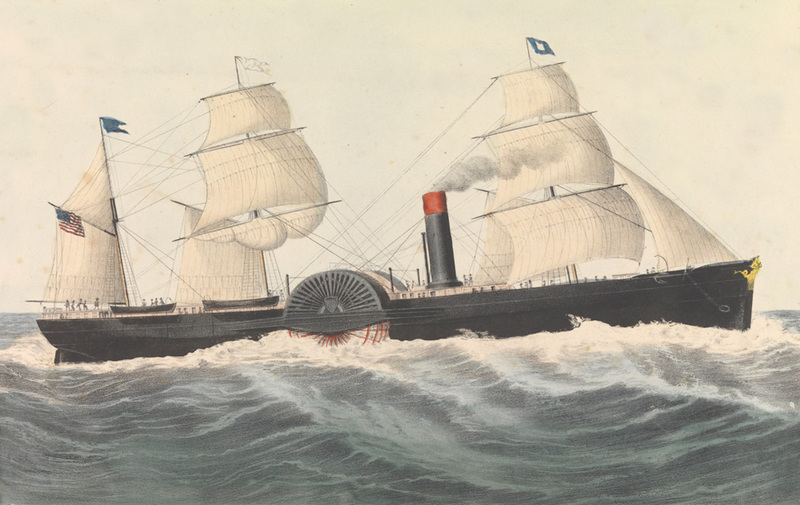 The new tonnage would be a pair beginning with the 5,000-tonner Britannic in 1874. With an average Atlantic crossing time of over 15 knots, she took both the west- and the eastbound speed record, thus acquiring the prestigious Blue Riband. The Britannic became an immediate success on the North Atlantic, and regular passengers could not wait for her future sister to enter service. 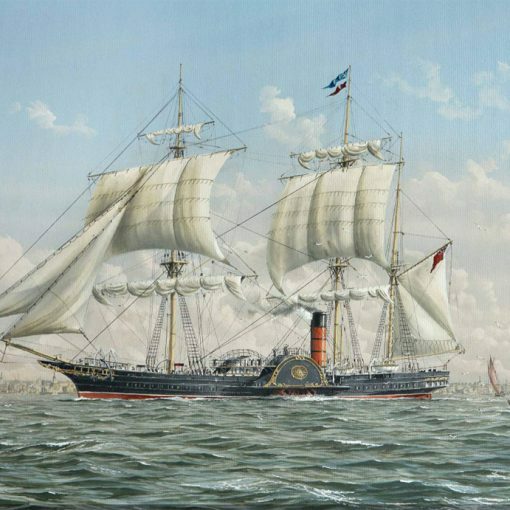 Finally, on July 15, 1874 the brand new Germanic was launched into the River Lagan from her Harland and Wolff slip. Just like the Britannic, the Germanic had cost the White Star Line £200,000 to build. That is to compare with Cunard Line’s ‘Project Queen Mary’ of today, which will cost approximately £3,000,000,000. Also, like the Britannic, the Germanic had had a drop-propeller system installed, but as it was discovered on the Britannic that it was not very useful, the system was removed on the still-not-completed Germanic. 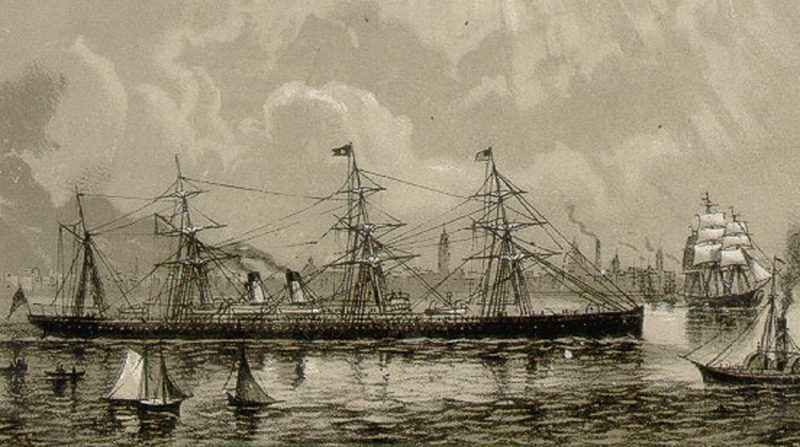 In early 1875, the Germanic was completed, but she was kept in Belfast until May because White Star did not want to receive her until the start of the Atlantic summer season. Then, on May 30, when furnished and painted, she set out on her maiden voyage. 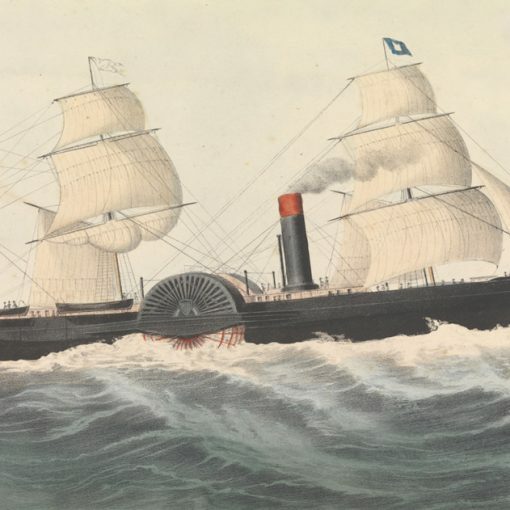 She replaced the White Star Line’s first steam vessel – the Oceanic. In July, the Germanic managed to take the Blue Riband into possession on the eastbound run. She had crossed the Atlantic in a mere seven days, eleven hours and seventeen minutes, resulting in an average crossing speed of 15.76 knots. In February the next year she bettered her eastbound record somewhat and by this time the sisters Britannic and Germanic was recognised as the best liners in service. The first major problem that occurred with the Germanic took place when the ship was south east of Ireland. The propeller shaft snapped, and Germanic had to use her sails in order to make it to the Irish port of Waterford. 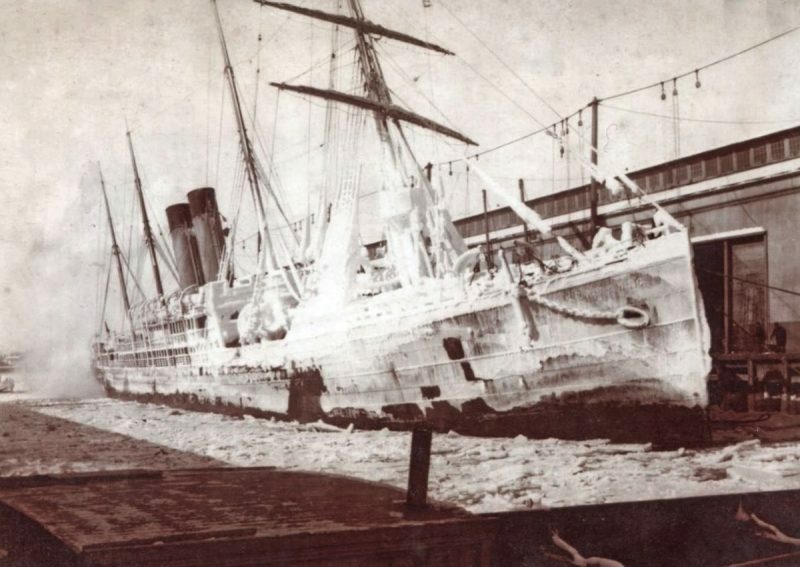 In 1895, White Star ordered the Germanic to go through a major refit to modernise the ship. The old engine had to give way for one of the new breed – a triple expansion one. 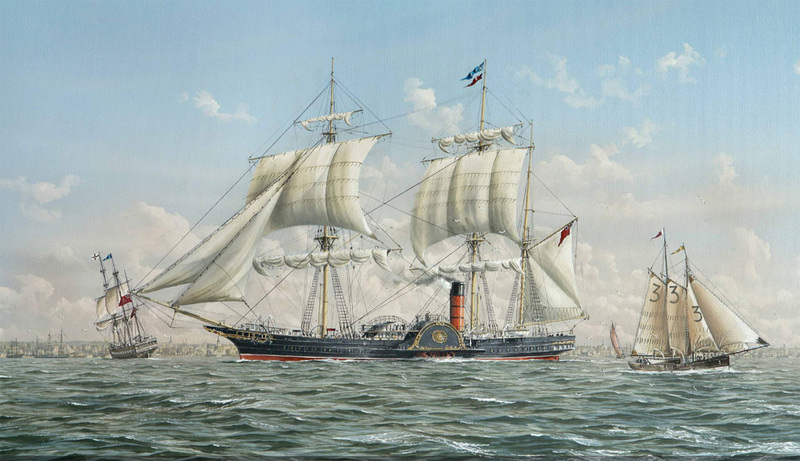 Added to this, her funnels were heightened and the distinguished rigging on the masts were removed. 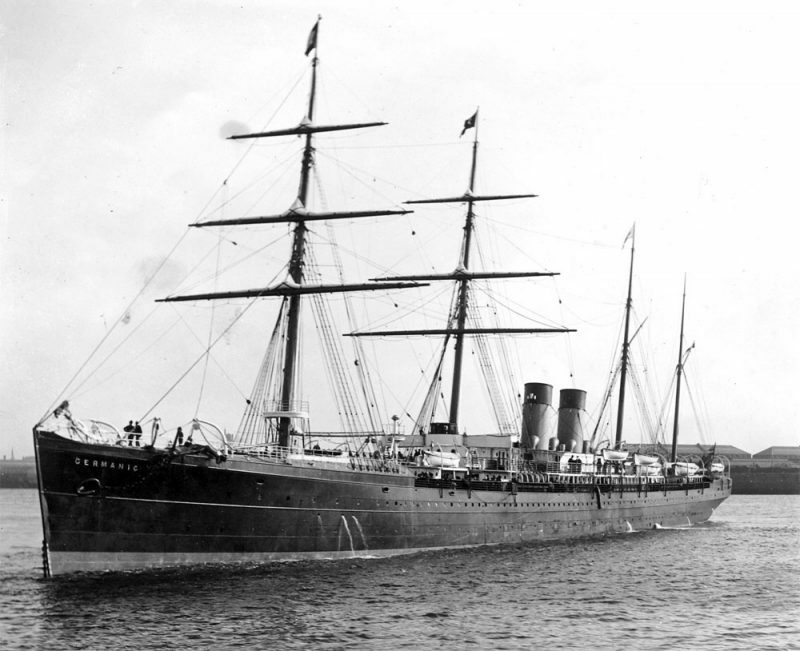 One of the most dangerous events for the ship itself in the Germanic’s long career occurred on February 13, 1899. The ship had arrived in New York a few days earlier, partly covered in ice and snow which caused her to list to starboard. On the 13th (a Monday, not Friday), the ship was to take on coal for her next crossing when a severe blizzard hit the harbour. The winds pushed the ship to heal over to port, but the accumulated snow and ice had made her top-heavy, and she swung back to a starboard list within an hour. This rocking motion allowed water to enter through the open coaling doors, causing the Germanic to sink to the bottom of the river, with the ship’s side resting against the dockside. When the ship was sounded shortly afterwards it was discovered that her passenger accommodation areas had amazingly not been damaged beyond repair. This fact probably saved the 24-year-old vessel from scrapping, and ten days later she was righted so that water could be pumped out and the hull patched up in order to get the ship to Belfast for refurbishment. Germanic was out of service for another four months altogether before she was put back on her ordinary Liverpool-New York service in early June, just in time for the summer season. In late 1903, the IMM decided to move the Germanic within the company to the smaller American Line. The final voyage she made under White Star authority was on September 23, and the rest of the winter she spent laid up. 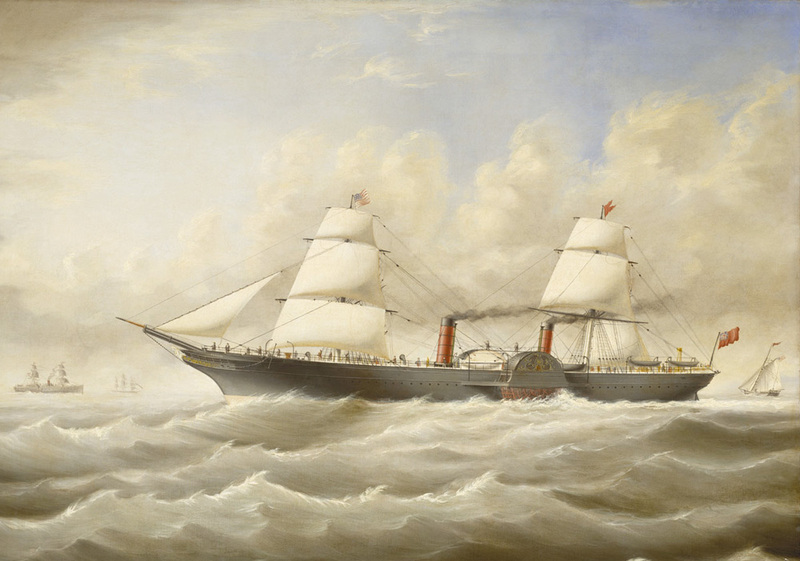 When the American Line officially acquired the vessel, they decided to keep the name Germanic instead of renaming her. 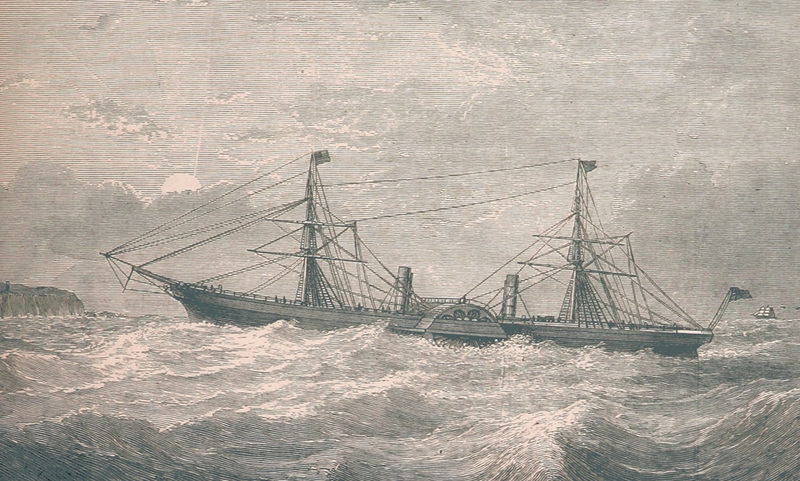 The new route was between Southampton and New York. However, Germanic did not stay long in the American Line. After only six voyages she was transferred again to the Dominion Line. From now on she would only carry emigrants. In 1905, the Germanic was finally renamed and her new name became Ottawa on January 5. She was now transferred to Canadian waters only during the summers when she sailed regularly between Québec and Montreal. She stayed on this service for another four years. In October 1909 she was laid up, awaiting an uncertain future. The saviours of the Ottawa proved to be from Turkey. In 1910, the Turkish Government bought the vessel for transport use. She was to become part of a fleet consisting of five other ships. 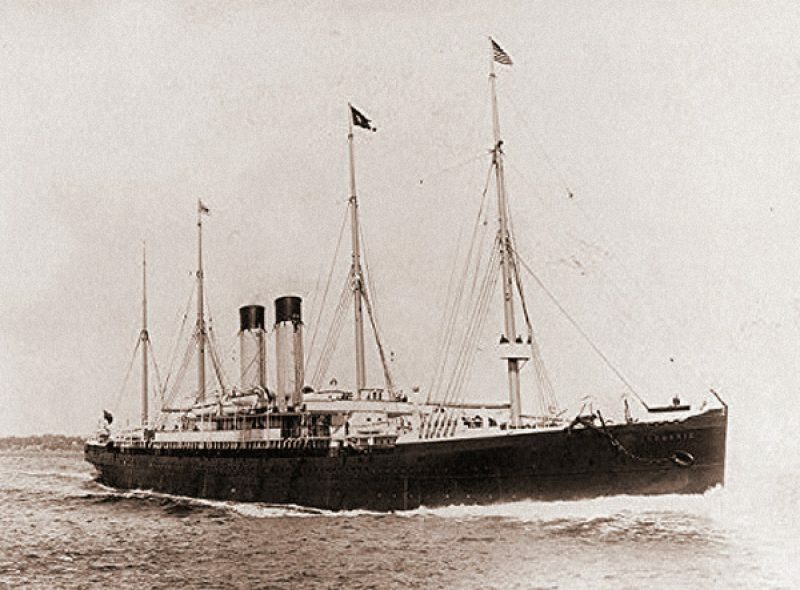 She left Liverpool on March 15, 1911 and sailed for her new home country. By this time she had been renamed Gul Djemal. She would be operated by the Administration de Nav. A Vapeur Ottomane in Istanbul. Later the same year the ex-Germanic carried Turkish troops to the war in Yemen. During World War I, the Gul Djemal was still in Turkish ownership, thus serving on the German side of the conflict. In April 1915, the vessel was used as a transport to rush Turkish troops to the Gallipoli Peninsula. They were certainly needed from the German point of view, since the British and the French had landed a giant army there together as an attempt to gain control of the strategic area. But one of the most terrible sea disasters in history occurred the same year on May 3, when the Gul Djemal was torpedoed and sunk down to the superstructure. At the moment she was carrying more than 4,000 troops of which the majority was lost in the waves. The Allied U-boat responsible – the E 14 – could claim an enormous bounty of £5 per Turk, plus assessed value. But the end of the former Germanic had not come yet. Because the ship had not sunk, and due to the need of transport ships, she was raised and sent to be repaired. The wartime history continued, and in 1918 the ship carried 1,500 German soldiers to the Allied control-point at Dover. Much confusion arose, with the result that all military personnel was disarmed and sent home to Germany. 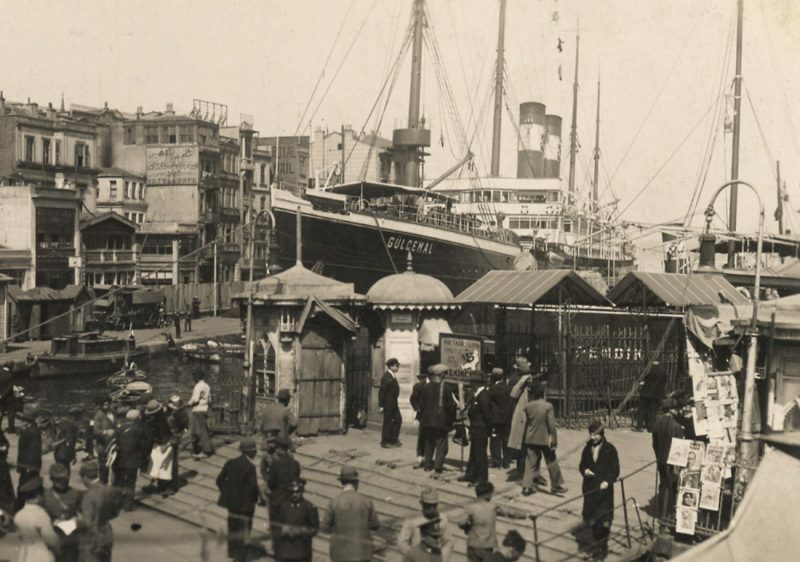 After the war, the Gul Djemal was transferred to the Ottoman American Line for emigrant service between Istanbul and New York. In this guise she made her first voyage on October 10, 1921. Some years later she had been transferred to the Turkish Black Sea coast. In 1928, she was again transferred, this time to Turkiye Seyrisefain Idaresi, and she was renamed Gulcemal. The rest of the Gulcemal’s career was not short, but not very eventful either. Some occurrences worth noting though, was that she grounded in the Sea of Marmora in 1931, and that she was degraded to a store ship in Istanbul as late as 1949. In 1950 she had become a floating hotel, but on October 29 the ex-Germanic’s fate had come very close. She was towed to Messina for breaking up after a 75-year-old record career. She had entered service under British authority when the state of Germany was very young. Two world wars later she had been on the other side, fighting together with Britain’s enemies. The former White Star liner had never lost her dignity, and when she was towed away to the scrap yard in Messina the old Germanic still sported the distinguished golden stripe along her hull. My great great grandparents came to the USA on the Germanic in 1891. I’d love to get a copy of the photo “Germanic at anchor”. Where can I download and/or purchase it? How exciting with such a connection to the past, Steve! I will contact you via e-mail regarding the photo.